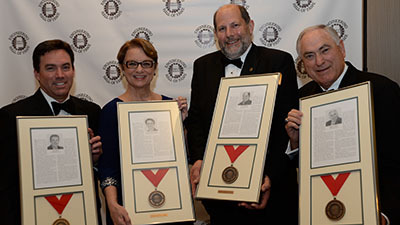 State of Alabama Engineering Hall of Fame inductees (L-R) Ken Smith, '81 civil engineering; Olivia Owen, '77 civil engineering; Larry Monroe, '79 chemical engineering; and Perry Hand, '69 civil engineering. The State of Alabama Engineering Hall of Fame inducted six individuals, including four Auburn alumni, and honored a project during a ceremony Saturday at The Westin Huntsville. This year’s inductees include Perry Hand, ’69 Auburn University civil engineering and Volkert chairman of the board; Larry Monroe, ’79 Auburn University chemical engineering and retired Southern Company chief environmental officer and research and environmental affairs senior vice president; Olivia Owen, ’77 Auburn University civil engineering and retired from ExxonMobil; Ken Smith, ’81 Auburn University civil engineering and Spire president; Danny Glover, ’80 University of Alabama civil engineering and retired from Alabama Power; and Vicki Hollub, ’81 University of Alabama mineral engineering and Occidental Petroleum president and CEO. The Big Spring Water Treatment Plant and Supply Improvements in Tuscumbia was selected under then projects category. Perry Hand spent nearly 40 years serving the public, using his expertise to better the state of Alabama whether through government service or as a leading engineer. As chairman of the board of Volkert, Inc., in Mobile, Hand’s leadership and insistence to advance technology applications to old problems continue to improve the infrastructure industry in Alabama and other areas of the United States. He became a public servant when elected to the Alabama Senate in 1983 and again in 1986, and he sold his business in 1989 when he became the secretary of state for Alabama. In 1991, he was appointed highway director for the state with responsibility for all state highway design, construction and maintenance. He retired from government service in 1993 and joined Volkert. Since taking over leadership roles in Volkert, Hand has been instrumental in securing contracts for many important construction and engineering jobs throughout the region, including some of the most high-profile improvements within the state. They include a $700-million project to replace more than a mile of elevated Interstate 20/59 through downtown Birmingham; preliminary and final design of Corridor “X,” now Interstate 22; and the $125-million Baldwin Beach Express that opened in 2014. Volkert also provided several services to help restore habitats on the Little Bay peninsula, which was severely eroded by Hurricane Katrina. The project received the 2011 Guardian Award from the EPA and the Excellence Award from the Association of Conservation Engineers and was inducted into the Alabama Engineering Hall of Fame. Larry Monroe has improved the quality of life for the people of Alabama because of his attention to environmental innovation. His research and development efforts made a significant bottom-line impact in the production of clean, affordable electricity. He served as a public leader, industry expert and a research innovator to make the environment a better place, leaving a legacy sure to be felt by generations to come. Monroe demonstrated his commitment to protecting and conserving natural resources through research and development in academia as well as government and industry research. He retired as Southern Company’s chief environmental officer in 2017. Among his work was groundbreaking research on mercury control from power plants at Alabama Power’s Plant Gaston in Wilsonville, which highlighted mercury emissions and regulations. Garnering national media attention, the work also garnered an R&D 100 Award from R&D magazine in 2003. Nationally recognized, Monroe testified before both chambers of Congress on developing technologies for coal-fired power plants on behalf of Southern Company, and also took his environmental message to the Public Service Commissions of Georgia and Mississippi. Among his honors include being ranked in 2013 as No. 16 among the top 25 most influential people in the power industry during the past 25 years, according to Power Engineering magazine. He was also honored by the Electric Power Research Institute with six technology transfer awards, which recognize leaders who transfer research into applied results. In late 2017, he was appointed by the Environmental Protection Agency’s Administrator to serve on EPA’s Science Advisory Board. Olivia Owen made a lasting contribution in the petroleum industry, along the way becoming a role model, inspirational leader and mentor to others pursuing engineering careers in a remarkable career that spanned the globe. During her distinguished 34-year career with the ExxonMobil Corporation, her exemplary work and exceptional engineering prowess earned her great respect within the company, and she rose to leadership roles with diverse assignments and crucial responsibilities. Ultimately, she became a vice president and Officer of the Corporation, a recognition of her performance and leadership, and was instrumental in overseeing four critical areas of the company – safety, security, health and environment. In 2004, Owen became the global security manager for ExxonMobil in Dallas. She had responsibility for developing and directing ExxonMobil's security program worldwide. She travelled to over forty countries, spanning six continents, and reviewed security initiatives with U.S. State Department regional security officers and with representatives from the U.S. Department of Homeland Security and the Department of Defense. Owen became an ExxonMobil Corporate Officer and was named the vice president for safety, security, health and environment in 2009. She retired in 2011. Ken Smith has devoted his life’s work to Alabama’s natural gas industry. During his 36-year career with Alabama Gas Corporation (Alagasco), he has steadily risen through the ranks with Alabama’s largest natural gas utility and has been committed to continuing the long legacy of the company’s leadership to serving its customers and communities. His contributions to Alagasco have benefited Alabama’s populace by expanding natural gas service throughout the state, ensuring their operations were focused on providing safe and reliable service, and supporting opportunities for economic development. Smith’s dedication to the next generation of engineers and to his community is also advancing Alabama and benefitting its citizens. Today, Smith is president of Spire Alabama, Spire Gulf Coast and Spire Mississippi (formerly Alagasco, Mobile Gas and Willmut Gas), which serves over 500,000 homes and businesses throughout Alabama and in parts of Mississippi. As president, Smith oversees more than 1,000 employees in the operation and management of 29,000 miles of pipelines with operating revenues in the hundreds of millions of dollars each year. His career has included responsibilities in industrial and commercial business development, coal bed methane exploration and production, engineering and serving as division manager in Gadsden. He has helped direct the construction of major pipeline installations within the state to access alternative gas markets, provide service to new and expanding industries for economic development opportunities, and ensure that the company’s pipeline infrastructure is continuously upgraded. Following the purchase of Alagasco in 2014 by The Laclede Group (now Spire, Inc.), Smith was selected as president of Alagasco in 2015. He has since led efforts to help merge the consolidation of their operations, which has also included the 2016 acquisition of Mobile Gas and Willmut Gas (MS). Daniel Glover has left an imprint on the history of his home state with 40 years of service to the people of Alabama. Through dedication to the power delivery systems of Alabama Power Company, he ensured homes and businesses received power, especially after natural disasters. Glover was selected to be the first contract services manager at Alabama Power, an operating subsidiary of Southern Company, in 1999. In this role, he oversaw the vegetation management program, leading it to an impressive $4 million in annual savings. Two years later, he became division manager for the Western Division with responsibility for construction, maintenance and engineering. In 2008, he was named Power Delivery services manager, responsible for the budgets of capital and operations and maintenance, distribution planning and many other areas. Glover was also over the Alabama Storm Center, which guides company line crews throughout a storm restoration process. A bit more than a year later, Glover was selected as the Distribution vice president, leading more than 1,700 employees in the design, construction and maintenance of more than 80,000 miles of distribution facilities that included smart grid development and deployment. It was in this position that Glover oversaw Alabama Power’s effort to restore electricity after a massive and devastating tornado outbreak on April 27, 2011. He set the ambitious goal to restore service within one week to 95 percent of the 412,000 customers left without power in the wake of the storm. Leading more than 11,000 employees, Glover personally oversaw the effort that resulted in 99 percent of customers restored with power within in seven days. The project led Alabama Power to win more awards for storm restoration than any electric utility in the nation. Glover retired in 2017 after 40 years with Alabama Power, having overseen a $272 million capital budget and $519 million operating budget his last year as Distribution vice president. Vicki Hollub has blazed a trail throughout her more than 35-year career, rising to become one of the most influential women in the global oil and energy industries. As president and chief executive officer of Occidental Petroleum Corporation, an international oil and gas exploration and production company, she is the first female CEO of a major oil company in the United States. The company is one of the largest U.S. oil and gas companies based on equity market capitalization. She has held a variety of management and technical positions with responsibilities on three continents, including roles in the United States, Russia, Venezuela and Ecuador. Before becoming president and CEO, Hollub served as Occidental’s president and chief operating officer, overseeing the company’s oil and gas, chemical and midstream operations. She has been a member of Occidental’s Board of Directors since 2015. She previously served as senior executive vice president, Occidental Petroleum Corporation, and President, Oxy Oil and Gas, where she was responsible for operations in the U.S., the Middle East region and Latin America. Prior to that, Ms. Hollub held a variety of leadership positions, including executive vice president of Occidental; president of Oxy Oil and Gas, Americas; vice President of Occidental; and executive vice president of U.S. Operations for Oxy Oil and Gas; executive vice president of California Operations; and president and general manager of the company’s Permian Basin operations. The National Diversity Council selected Hollub in 2015 as one of the “Top 50 Most Powerful Women in Oil and Gas,” a definitive list of female executives, influencers and achievers impacting the oil and gas industry. Fortune magazine named her one of the “Most Powerful Women,” noting Hollub is part of an elite group of women CEOs of Fortune 500 companies. The Big Spring Water Treatment Plant in Tuscumbia is Alabama’s first water utility to use a series membrane process train. Opened in 2012, the nationally recognized project included a “green field” water treatment facility in an historic downtown area of the city. The facility represents the best available technology for water treatment, and will be an example of engineering excellence for years to come. Planning for the new treatment facility began in 2008 with multiple options considered in the evaluation of the city’s treatment challenges. The city selected a unique and viable solution developed by engineers at Garver, a multi-disciplined engineering, planning, and environmental services firm committed to quality practices, progressive methods and honorable relationships. Since the Tuscumbia water treatment plant is located within an historic park, it was important the treatment facility’s aesthetics blend in with the surroundings. Garver used building information modeling (BIM) to provide rapid prototyping and realistic 3-D renderings to enhance design and aid in public communications and awareness. Garver created 3-D renderings that revealed how the facility’s exterior and interior might look with certain windows and brickwork. Using BIM proved beneficial in visualizing a structure that fit within the confined site overlooking the park. For this work, Garver was awarded Grand Conceptor by the Alabama ACEC and was a national finalist for innovative design. The state-of-the art filtration technology is the centerpiece of the new 4 million gallons-per-day (MGD) water treatment plant. That doubled treatment capacity for the city, and the plant has the ability for a future expansion of 6 MGD. The State of Alabama Engineering Hall of Fame was chartered by the governor in 1987 to honor those men, women, corporations and projects associated with the state that have brought credit to the engineering profession. A total of 178 engineers, 43 projects and 32 firms have been recognized by the hall. These inductees span from border to border, across all industries, and personify the impact engineering has played on the economy, quality of life and standard of living for the people of Alabama.